In what may be one of the biggest acquisitions in recent years, Microsoft made a surprise announcement that it is acquiring business-oriented social networking site LinkedIn for $26.5 billion. Its current Chief Executive Officer Jeff Weiner will be retaining his position but will report to Microsoft CEO Satya Nadella. The company itself will also be retaining its own brand while possibly integrating itself with related Microsoft products. The deal is expected to be officially sealed by the end of the calendar year. While the price tag raised a few eyebrows, there is no denying that LinkedIn is a massive buy for Microsoft with its more than 433 million members, 105 million unique visitors every month, and over 7 million active job listings on their site. It has also become a content aggregator of sorts and even a publishing platform for business-related publications and publishers. The site is also more accessed through its mobile apps, which is something that Microsoft has been struggling with on its own platform but has had more success in the apps for other platforms, including Android. Now as to what this will mean for LinkedIn in the future is still unclear right now. There were no specific plans yet when they made the acquisition announcement, except to say it will be put in the Productivity and Business Processes Segment. We will probably see Microsoft’s business-related apps like Office, Cortana, and Skype eventually being integrated into the service and vice versa, which may be a good thing for LinkedIn eventually. The boards of both Microsoft and LinkedIn quickly approved the deal and so it will be up to the latter’s shareholders to give the final approval, as well as passing the regulators as well. Microsoft is paying for its new “toy” with cash, so this will probably be approved by the shareholders quickly as well. Microsoft has released a new beta build of Windows 10 aimed at enhancing various aspects of the operating system, including support for the LastPass extension in the Edge browser, as the company hurtles toward releasing a major update in the coming months. Build 14361, released Wednesday, includes updated icons, the LastPass password manager extension for Microsoft Edge, and support for running Docker containers natively on Windows. 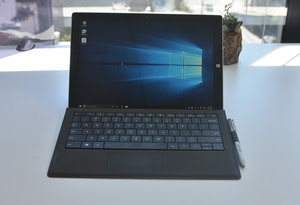 Windows Ink, Microsoft's tools for working with pen input on a touchscreen Windows 10 device, also received several improvements. The build is another one on the road to what Microsoft is calling the Windows 10 Anniversary Update -- a major release of its latest operating system that packs in a slew of new features.